CD review: "Queen of the Organ: Shirley Scott Memorial Album"
Talk of the great organ players in jazz usually comes down to a debate on the relative merits of Jimmy Smith, Jimmy McGriff and Dr. Lonnie Smith. 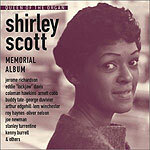 Generally absent from such discussions  unfairly, perhaps criminally so  is the late Shirley Scott. Let's be straight about this: The jazz world wasn't ready for a heavyweight woman instrumentalist in the '50s and '60s. For as a new compilation from Prestige (a subsidiary of Berkeley's Fantasy Records) shows for anyone with ears to listen is that Shirley Scott was one of the all-time monsters of jazz organ. Scott was possessed of one of the most identifiable touches on keyboard; just a few bars, and if you're at all acquainted with her work, you know that's her at the Hammond B-3. Although that's one of the wonders of Scott  she played the modern Hammond but made it sound more like a Wurlitzer. And she played with a sense of high art  she didn't have the modern sound of Smith or McGriff, but hewed closer to the classic stylings of Count Basie or Jay McShann. Although she continued to record until the mid-'90s (she passed in March 2002), "Queen of the Organ" focuses on her early recordings, from 1958-'64, both as leader and in a backing role. Regardless, Scott played always with true taste, combining a blues-based soul with an evening-gown elegance. In many ways, Scott's playing was the epitome of dinner jazz  smart, sophisticated, cool.